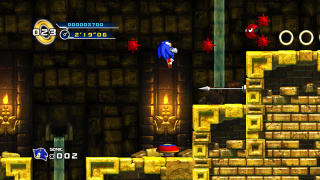 Lost Labyrinth Zone is the third level in Sonic the Hedgehog 4: Episode I. It appears to be set underground, similar to Sonic 1's Labyrinth Zone, and draws similar comparisons to Hydrocity Zone from Sonic 3. 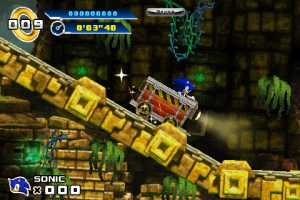 This zone is known for the controversial minecart gimmick that was in the second act in the PartnerNET build, which involved Sonic controlling a minecart in the entire level. Due to responses from the fanbase, the minecart act became an exclusive level in the iPhone version, and the console version received an entirely new act. Super Sonic will light up the entirety of the console version of Act 2 with his golden glow, making the level much easier. He can also breathe underwater indefinitely. Jaws - Piranha bots that troll around underwater. Bubbles - A blue floating bubble bot. Red spiked variations also appear. Orbinaut - Simple sphere bots that move back and forth very slowly. The catch is that they're circled by four spiked balls, which move in a pattern and can only be attacked for a short time. Burrobot - Mole bots that leap from the ground and then simply move back and forth in a small area. Unidus - These guys look exactly like Orbinaut. They're a bit more hot-headed, though, and will fire off their shield of mines. This page was last edited on 27 April 2018, at 15:41.